5 Pollen Street is the brainchild of Head Chef Stefano Cavallini who had the distinction of being the first Italian chef to receive a Michelin star in 1995 for his restaurant ‘Stefano Cavallini at The Halkin’. This place is glamour personified with its art-deco inspired décor and luxurious surroundings. But this place was not cheap, and the privilege of sitting in this beautiful looking restaurant located just off Hanover Square in Mayfair came at a price. The pasta in a stracci di pasta with rabbit ragout (£15) was nicely done and cooked al dente. The flavour of the rabbit ragout was pleasant and tasty, but it was also a little salty and slightly runny. My current benchmark for a good ragout is the pappardelle duck ragout at Enoteca Turi which, at £11.75, was outstanding. This rabbit ragout was decent, but on a comparative basis it didn’t achieve that same high standard as at Enoteca Turi. Furthermore, the presentation was dull, and at £15, the portion size was also small. 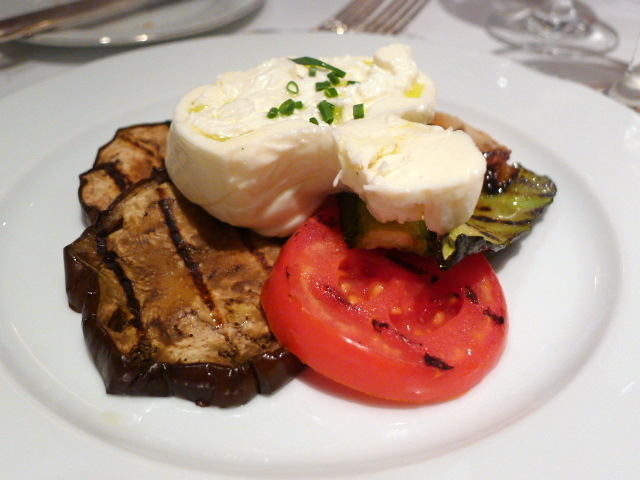 Burrata di ‘Andria’ (£13) was beautifully creamy with a soft luxurious centre. It was served with some nicely grilled vegetables and a fragrant oregano-infused olive oil. But the dish could have done with some balsamic vinegar for a more sparkling finish. 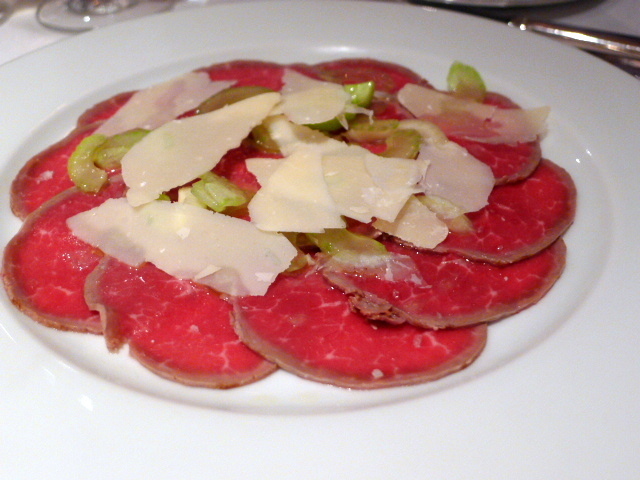 Beef carpaccio (£14) was resplendent with flavour and the accompanying celery and parmesan provided bite and crunch. 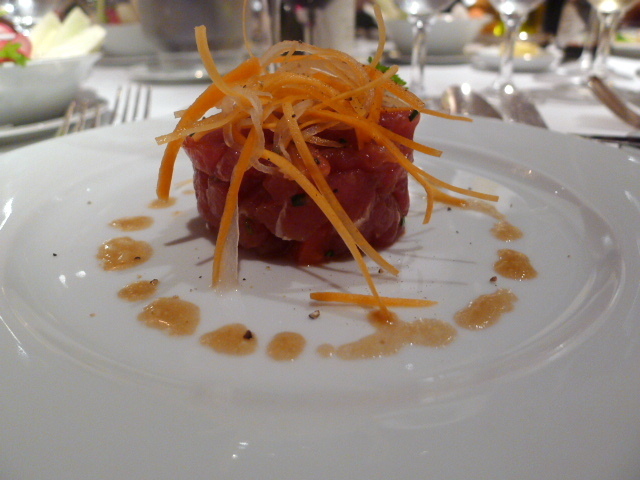 Tuna tartar with balsamic and soy sauce dressing (£17) was lovely and fresh. The tuna was of an excellent quality and the soy sauce dressing worked well with the fish. But a touch of sesame oil might have helped to lift it. 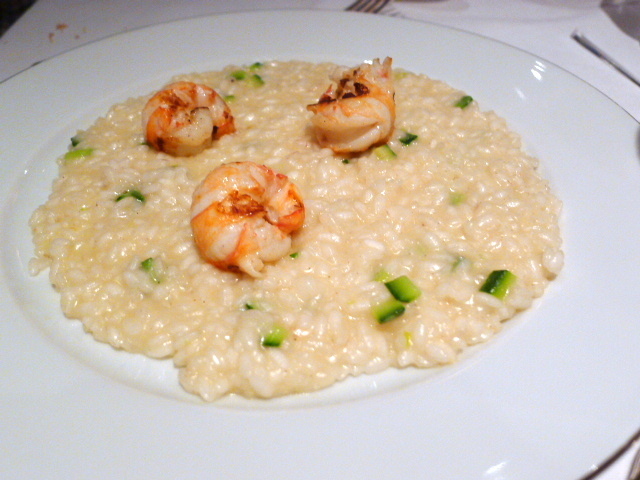 Riso mantecato with scampi and courgette (£17) was nice and creamy, the scampi was firm and tasty, but again the presentation was lacklustre. 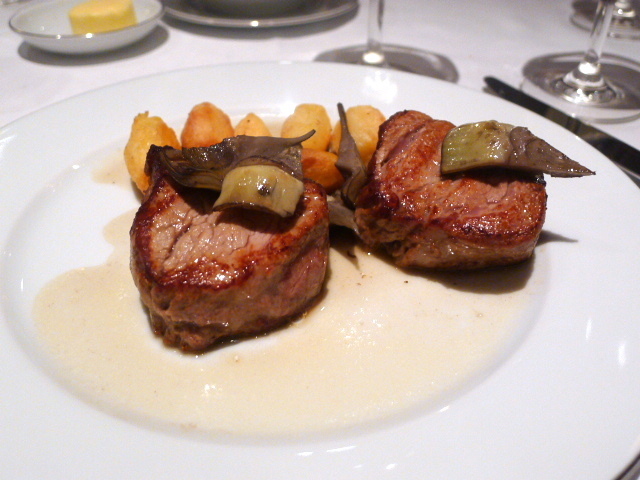 Beautiful pieces of tender veal medallions (£27) with artichokes had been cooked to a medium rare perfection. Unfortunately there were also some dodgy potatoes taking up room on the plate, allegedly roasted, but better described as pre-cooked, reheated and not crunchy. For a dish that cost £27, these less than average potatoes was a huge disappointment. 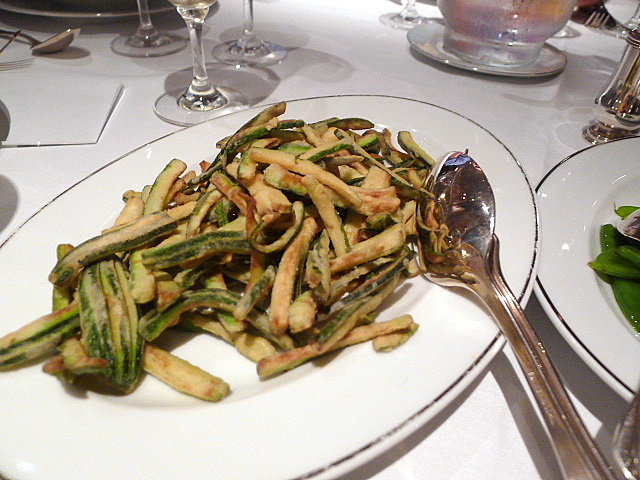 A side of deep fried zucchini (£5) was also horrible. This dish was so salty it was completely inedible. 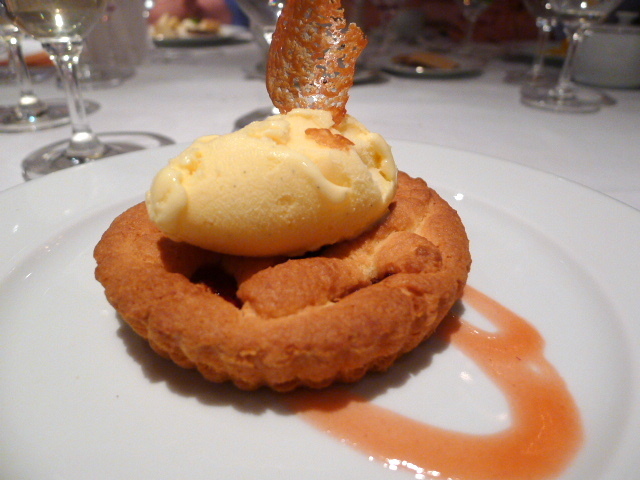 Desserts of raspberry tart with mascarpone cream (£8.50) and apple tart with calvados sauce (£8.50) were nicely done. The pastry in the raspberry tart was excellent, as was the mascarpone cream, and the calvados sauce worked well with the apple. The service was mixed. Our serving waitress was lovely, but the maitre’d ignored us when we tried to ask him questions about the menu at the beginning of the meal. On the whole, the food at 5 Pollen Street was tasty and decently executed. But I had expected better at these prices. Instances of over seasoning, bad potatoes and dull presentation can’t be overlooked at a restaurant which pitches itself at the high end of the scale. This place was pricey. What’s more, 5 Pollen Street was also engineered to make you spend. Bottles of both still and sparkling water were brought to the table at the beginning of the meal in what appeared to be an attempt to force us into ordering bottled water, without allowing us an opportunity to ask for tap water. There was also a £2.50 cover charge per person, printed on the menu in a script so small that you needed bionic eyes to read it. On its own merits, the food was good. 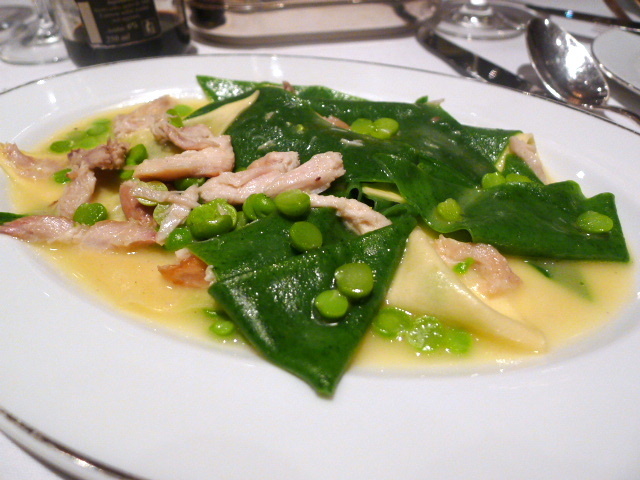 But there are better Italian restaurants which are just as good – better even – and cheaper like Enoteca Turi and Tempo. They may not be as glamorous, but why pay more than you have to? On balance, 5 Pollen Street wasn’t worth it. You will feel the sting in your pocket but not the relative joy in your tummy. 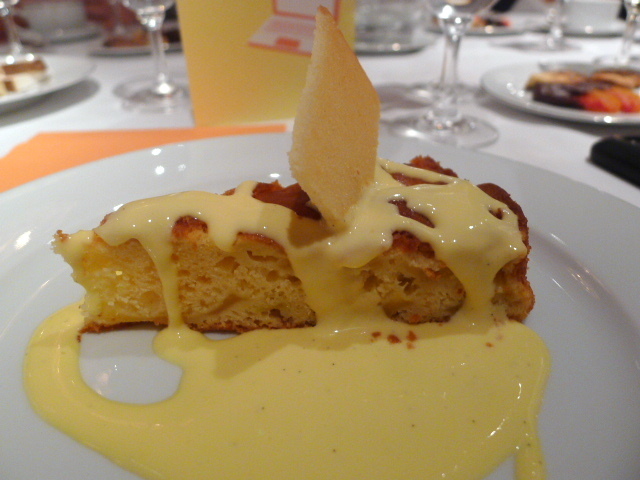 Price range: £40 – £71 for three courses. Excludes drinks and service.